I’m a huge fan of fiber. It has many important health benefits including weight management, heart health, and regularity. But less than 5% of Americans get enough fiber from the foods they eat. The daily recommended fiber intake is 38 grams for men and 25 grams for women, but diets low in fruits, vegetables, beans, whole grains, and other fiber-filled foods can leave you feeling weighted down. Can we get personal? For the most part, I eat plenty of fiber-rich foods and my daily bathroom routine has never been a problem. But this year has been different, which is why I recently took the Metamucil Two-Week Challenge to get back on track and discover what lighter feels like by promoting regularity. * Now that I’ve completed the Challenge, my goal is to continue taking Metamucil each day to keep up my healthy routine. It’s been a busy year with a lot of travel, so it’s been tough getting enough fiber each day to keep things moving smoothly. 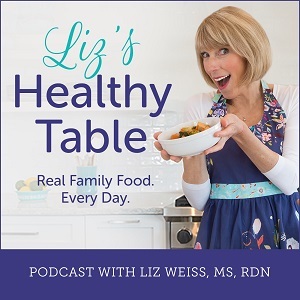 Between the launch of the Liz’s Healthy Table blog and podcast, various speaking engagements, nutrition conferences, work commitments, family gatherings, and a bit of fun, I’ve traveled from coast to coast — not once but twice — and across the Atlantic … not once but twice! Are you ready for this? I’ve been to New Orleans, Lido, CA, Napa, CA, Paris, Copenhagen, Nantucket, New Paltz, NY, New Hampshire, Portland, Maine, Vermont, New York City, Chicago, Birmingham, AL, Little Rock, AR, Toronto, Kansas City, and Connecticut. 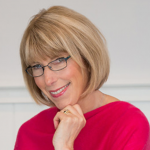 Oh, and I just got back from five glorious nights in Riviera Maya, Mexico, which is where and when I decided to start the Metamucil Two-Week Challenge … and I’m glad I did! #AD Take the Metamucil Two-Week Challenge to increase your daily fiber intake with psyllium super fiber @Metamucil #MetamucilChallenge. Here’s my story. 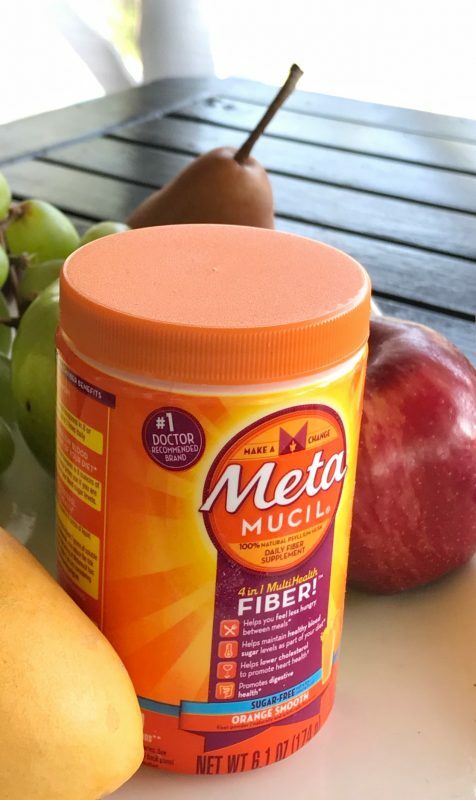 By simply adding a serving of Metamucil to my busy daily routine, I’ve been able to easily sneak more fiber into my day, which as I’m sure you know, can be tough when you’re on the go, eating out, and looking for something decent to eat at the airport! Here’s how the Challenge works and how it has worked for me. Sign up for the Two-Week Challenge and you’ll receive daily emails along the way with helpful tips. Start the Challenge slowly by taking one rounded teaspoon of Metamucil daily. The first few days, you might experience minor bloating, but don’t worry. It’s simply your body getting used to the increase in fiber. The psyllium fiber in Metamucil helps trap and remove the waste that weighs you down, so you can start to feel lighter* in two weeks. I’ve been taking one rounded teaspoon every morning by mixing it into an 8-ounce glass of cold water. You can use other liquids like 100% fruit juice or your favorite smoothie. See how your body feels with one teaspoon. You can increase from there taking up to three times per day. My husband, Tim, has been taking Metamucil for years. In fact, if you were to meet Tim at a cocktail party, he’d probably tell you how great he has felt since starting it. At breakfast, he mixes a teaspoon into orange juice and takes another teaspoon mixed into water before dinner. Adding Metamucil to his diet has worked wonders to support his regularity. Of course, now I understand what Tim has been talking about all these years. Fiber Smarts: If your diet is low in fiber, adding psyllium fiber found in Metamucil to your daily routine can fill in your fiber gap. One rounded teaspoon of Metamucil has 3 grams of fiber, which is the same amount of fiber in 1 medium banana, 1 orange, 1 halved cup of strawberries, and a handful of pistachios. It’s amazing how small lifestyle changes can have a big impact on your health and your overall feeling of wellbeing. So if you’re feeling sluggish and want a simple solution, try the Two-Week Challenge. I’m more than pretty confident you’ll like how you feel. Mobley, A. R., et al. Identifying Practical Solutions to Meet America’s Fiber Needs: Proceedings from the Food & Fiber Summit. Nutrients. July 2014. https://www.ncbi.nlm.nih.gov/pmc/articles/PMC4113755/. Accessed April 2018. Chart of High-Fiber Foods, Mayo Clinic Staff. Source: USDA National Nutrient Database for Standard Reference, Release 27. I’m excited to start the two week challenge. I’m excited to start the two week challenge. Thank you bunches! Yes I will be trying the challenge and getting my stomach down. Can you do the two week challenge with the fiber thins instead of powder? If so, how many thins daily? The ideal form of Metamucil for the Two-Week Challenge is any of the powder forms that can be mixed into water, juice or even a smoothie, and using the Fiber Thins as a supplement to your new, healthy routine! For more information, visit Metamucil.com. I started the 2 week challenge 5 days ago to help with IBS. First day only 1 tsp in 8 ozs water after 3 days 2 tsp in my breakfast smoothie. So far it hasn’t aided in my BMs and my stomach feels a bit bloated and sore. I’m hoping it will get better. DR said maybe I wasn’t taking enough so I”m uping it today to 2 tsp twice a day and see what happens. I’m hoping for regularity and ease from my problem. I gotta say this Metamucil is pretty gross. I mix it with water and its tolerable but not tasty. today I mixed it with my yogurt and I hated the consistency of it! ughhhh!!!! I guess I will just do it in water and see if I can make it through the 2 weeks! I started today. I did 2 teaspoons in a glass of water like it said on the container..Hope that was ok. I put a TBSP in just a couple It’s of water and shoot it down. Then chase it with more water to cleanse the palate and away ya go.